Each year, an average of eleven tropical storms develop over the Atlantic Ocean, Caribbean Sea, and Gulf of Mexico. Many of these remain over the ocean and never impact the U.S. coastline. Six of these storms become hurricanes each year. In an average 3-year period, roughly five hurricanes strike the US coastline, killing approximately 50 to 100 people anywhere from Texas to Maine. Of these, two are typically "major" or "intense" hurricanes (a category 3 or higher storm on the Saffir-Simpson Hurricane Scale). An intense tropical weather system of strong thunderstorms with a well-defined surface circulation and maximum sustained winds of 74 mph (64 kt) or higher. Hurricanes are categorized according to the strength of their winds using the Saffir-Simpson Hurricane Scale. A Category 1 storm has the lowest wind speeds, while a Category 5 hurricane has the strongest. These are relative terms, because lower category storms can sometimes inflict greater damage than higher category storms, depending on where they strike and the particular hazards they bring. In fact, tropical storms can also produce significant damage and loss of life, mainly due to flooding. Low values (less than about 23 mph / 37 kph) of vertical wind shear between the surface and the upper troposphere. Vertical wind shear is the change in wind speed with height. 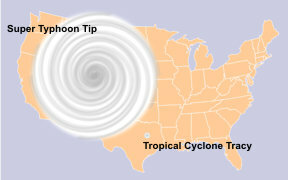 The warm water is one of the most important keys as it is water that powers the tropical cyclone (see image above right). As water vapor (water in the gaseous state) rises, it cools. 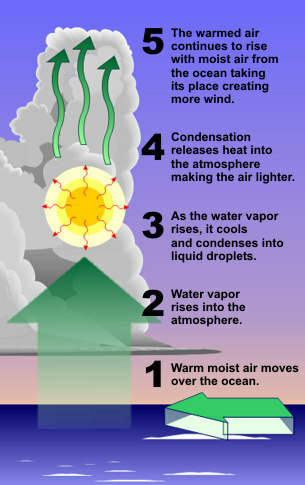 This cooling causes the water vapor to condense into a liquid we see as clouds. In the process of condensation, heat is released. This heat warms the atmosphere making the air lighter still which then continues to rise into the atmosphere. As it does, more air moves in near the surface to take its place which is the strong wind we feel from these storms. Therefore, once the eye of the storm moves over land will begin to weaken rapidly, not because of friction, but because the storm lacks the moisture and heat sources that the ocean provided. This depletion of moisture and heat hurts the tropical cyclone's ability to produce thunderstorms near the storm center. Without this convection, the storm rapidly diminishes. Given that sea surface temperatures need to be at least 80°F (27°C) for tropical cyclones form, it is natural that they form near the equator. However, with only the rarest of occasions, these storms do not form within 5° latitude of the equator. This is due to the lack of sufficient Coriolis Force, the force that causes the cyclone to spin. 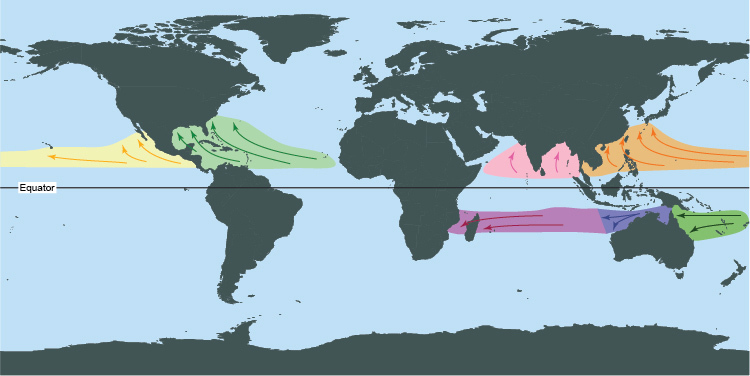 However, tropical cyclones form in seven regions around the world. 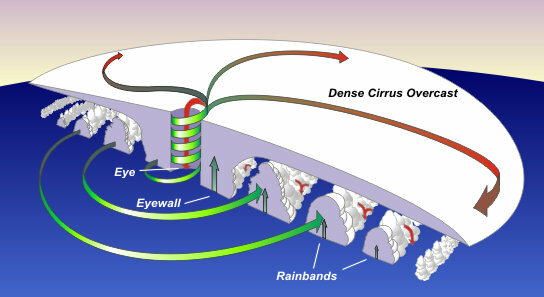 The main parts of a tropical cyclone are the rainbands, the eye, and the eyewall. Air spirals in toward the center in a counter-clockwise pattern in the northern hemisphere (clockwise in the southern hemisphere), and out the top in the opposite direction. In the very center of the storm, air sinks, forming an "eye" that is mostly cloud-free. The hurricane's center is a relatively calm, generally clear area of sinking air and light winds that usually do not exceed 15 mph (24 kph) and is typically 20-40 miles (32-64 km) across. An eye will usually develop when the maximum sustained wind speeds go above 74 mph (119 kph) and is the calmest part of the storm. But why does an eye form? The cause of eye formation is still not fully understood. It probably has to do with the combination of "the conservation of angular momentum" and centrifugal force. The conservation of angular momentum means is objects will spin faster as they move toward the center of circulation. So air increases it speed as it heads toward the center of the tropical cyclone. One way of looking at this is watching figure skaters spin. The closer they hold their hands to the body, the faster they spin. Conversely, the farther the hands are from the body the slower they spin. In tropical cyclone, as the air moves toward the center, the speed must increase. However, as the speed increases, an outward-directed force, called the centrifugal force, occurs because the wind's momentum wants to carry the wind in a straight line. Since the wind is turning about the center of the tropical cyclone, there is a pull outward. The sharper the curvature, and/or the faster the rotation, the stronger is the centrifugal force. Around 74 mph (119 kph) the strong rotation of air around the cyclone balances inflow to the center, causing air to ascend about 10-20 miles (16-32 km) from the center forming the eyewall. This strong rotation also creates a vacuum of air at the center, causing some of the air flowing out the top of the eyewall to turn inward and sink to replace the loss of air mass near the center. The sudden change of very strong winds to a near calm state is a dangerous situation for people ignorant about a hurricane's structure. Some people experiencing the light wind and fair weather of an eye may think the hurricane has passed, when in fact the storm is only half over with dangerous eyewall winds returning, this time from the opposite direction within a few minutes. Where the strong wind gets as close as it can is the eyewall. The eyewall consists of a ring of tall thunderstorms that produce heavy rains and usually the strongest winds. 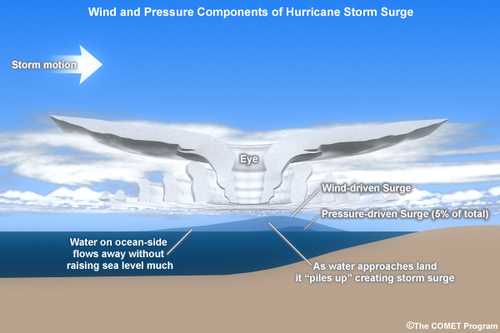 Changes in the structure of the eye and eyewall can cause changes in the wind speed, which is an indicator of the storm's intensity. The eye can grow or shrink in size, and double (concentric) eyewalls can form. In fact, if one were to travel between the outer edge of a hurricane to its center, one would normally progress from light rain and wind, to dry and weak breeze, then back to increasingly heavier rainfall and stronger wind, over and over again with each period of rainfall and wind being more intense and lasting longer. However, the hurricane's destructive winds and rains cover a wide swath. Hurricane-force winds can extend outward more than 150 miles (242 km) for a large one. The area over which tropical storm-force winds occur is even greater, ranging as far out as almost 300 miles (483 km) from the eye of a large hurricane. The strongest hurricane on record for the Atlantic Basin is Hurricane Wilma (2005). With a central pressure of 882 mb (26.05"), Wilma produced sustained winds of 175 mph (280 km/h). Other factors which can impact storm surge are the width and slope of the continental shelf. A shallow slope will potentially produce a greater storm surge than a steep shelf. For example, a Category 4 storm hitting the Louisiana coastline, which has a very wide and shallow continental shelf, may produce a 20-foot storm surge, while the same hurricane in a place like Miami Beach, Florida, where the continental shelf drops off very quickly, might see an 8 or 9-foot surge. Adding to the destructive power of surge, battering waves may increase damage to buildings directly along the coast. Water weighs approximately 1,700 pounds per cubic yard; extended pounding by frequent waves can demolish any structure not specifically designed to withstand such forces. The two elements work together to increase the impact on land because the surge makes it possible for waves to extend inland. Additionally, currents created by tides combine with the waves to severely erode beaches and coastal highways. 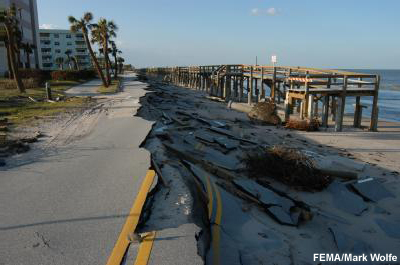 Buildings that survive hurricane winds can be damaged if their foundations are undermined and weakened by erosion. 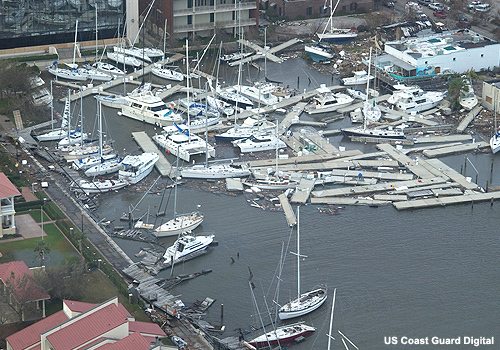 In confined harbors, the combination of storm tides, waves, and currents can also severely damage marinas and boats. In estuaries and bayous, salt water intrusion endangers the public health, kills vegetation, and can send animals, such as snakes and alligators, fleeing from flooded areas. Tropical cyclones with an organized system of clouds and thunderstorms with a defined circulation, and maximum sustained winds of 38 mph (61 kph) or less are called "tropical depressions". Once the tropical cyclone reaches winds of at least 39 mph (63 kph) they are typically called a "tropical storm" and assigned a name. Just a tropical cyclone in the Southwest Indian Ocean. Hurricanes are further classified according to their wind speed. The Saffir-Simpson Hurricane Wind Scale is a 1-5 rating based on the hurricane's present intensity. This scale only addresses the wind speed and does not take into account the potential for other hurricane-related impacts, such as storm surge, rainfall-induced floods, and tornadoes. Earlier versions of this scale – known as the Saffir-Simpson Hurricane Scale – incorporated central pressure and storm surge as components of the categories. However, hurricane size (extent of hurricane-force winds), local bathymetry (depth of near-shore waters), topography, the hurricane's forward speed and angle to the coast also affect the surge that is produced. 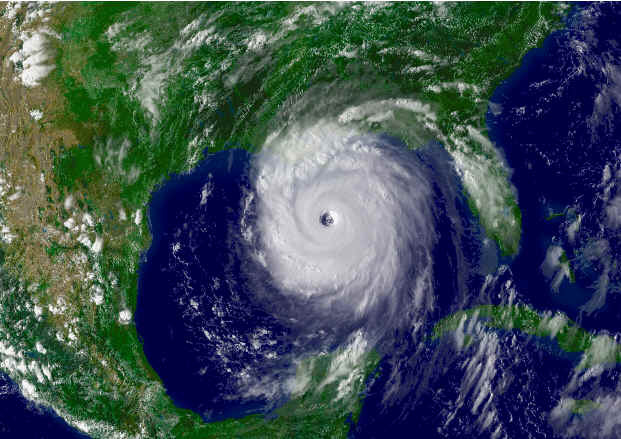 For example, the very large Hurricane Ike (with hurricane force winds extending as much as 125 miles (200 kilometers) from the center) in 2008 made landfall in Texas as a Category 2 hurricane and had peak storm surge values of about 20 feet (6 meters). In contrast, tiny Hurricane Charley (with hurricane force winds extending at most 25 miles (40 kilometers) from the center) struck Florida in 2004 as a Category 4 hurricane and produced a peak storm surge of only about 7 feet (2.1 meters). These storm surge values were substantially outside of the ranges suggested in the original scale. To help reduce public confusion about the impacts associated with the various hurricane categories as well as to provide a more scientifically defensible scale, the storm surge ranges, flooding impact and central pressure statements were removed from the scale and only peak winds are now employed. People, livestock, and pets struck by flying or falling debris could be injured or killed. Older (mainly pre-1994 construction) mobile homes could be destroyed, especially if they are not anchored properly as they tend to shift or roll off their foundations. Newer mobile homes that are anchored properly can sustain damage involving the removal of shingle or metal roof coverings, and loss of vinyl siding, as well as damage to carports, sunrooms, or lanais. Some poorly constructed frame homes can experience major damage, involving loss of the roof covering and damage to gable ends as well as the removal of porch coverings and awnings. Unprotected windows may break if struck by flying debris. Masonry chimneys can be toppled. Well-constructed frame homes could have damage to roof shingles, vinyl siding, soffit panels, and gutters. Failure of aluminum, screened-in, swimming pool enclosures can occur. Some apartment building and shopping center roof coverings could be partially removed. Industrial buildings can lose roofing and siding especially from windward corners, rakes, and eaves. Failures to overhead doors and unprotected windows will be common. Windows in high-rise buildings can be broken by flying debris. Falling and broken glass will pose a significant danger even after the storm. There will be occasional damage to commercial signage, fences, and canopies. Large branches of trees will snap and shallow rooted trees can be toppled. Extensive damage to power lines and poles will likely result in power outages that could last a few to several days. Hurricane Dolly (2008) is an example of a hurricane that brought Category 1 winds and impacts to South Padre Island, Texas. There is a substantial risk of injury or death to people, livestock, and pets due to flying and falling debris. Older (mainly pre-1994 construction) mobile homes have a very high chance of being destroyed and the flying debris generated can shred nearby mobile homes. Newer mobile homes can also be destroyed. Poorly constructed frame homes have a high chance of having their roof structures removed especially if they are not anchored properly. Unprotected windows will have a high probability of being broken by flying debris. 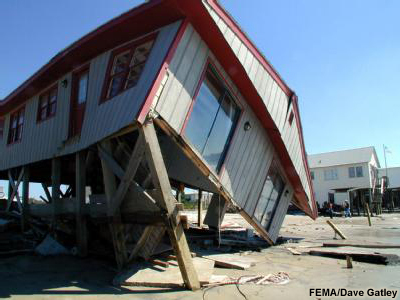 Well-constructed frame homes could sustain major roof and siding damage. Failure of aluminum, screened-in, swimming pool enclosures will be common. There will be a substantial percentage of roof and siding damage to apartment buildings and industrial buildings. Unreinforced masonry walls can collapse. Windows in high-rise buildings can be broken by flying debris. Falling and broken glass will pose a significant danger even after the storm. Commercial signage, fences, and canopies will be damaged and often destroyed. Many shallowly rooted trees will be snapped or uprooted and block numerous roads. Near-total power loss is expected with outages that could last from several days to weeks. Potable water could become scarce as filtration systems begin to fail. Hurricane Frances (2004) is an example of a hurricane that brought Category 2 winds and impacts to coastal portions of Port St. Lucie, Florida with Category 1 conditions experienced elsewhere in the city. Category Three Hurricane (Sustained winds 111-130 mph, 96-113 kt, or 178-209 km/hr). There is a high risk of injury or death to people, livestock, and pets due to flying and falling debris. Nearly all older (pre-1994) mobile homes will be destroyed. Most newer mobile homes will sustain severe damage with potential for complete roof failure and wall collapse. Poorly constructed frame homes can be destroyed by the removal of the roof and exterior walls. Unprotected windows will be broken by flying debris. Well-built frame homes can experience major damage involving the removal of roof decking and gable ends. There will be a high percentage of roof covering and siding damage to apartment buildings and industrial buildings. Isolated structural damage to wood or steel framing can occur. Complete failure of older metal buildings is possible, and older unreinforced masonry buildings can collapse. Numerous windows will be blown out of high-rise buildings resulting in falling glass, which will pose a threat for days to weeks after the storm. Most commercial signage, fences, and canopies will be destroyed. Many trees will be snapped or uprooted, blocking numerous roads. Electricity and water will be unavailable for several days to a few weeks after the storm passes. Hurricane Ivan (2004) is an example of a hurricane that brought Category 3 winds and impacts to coastal portions of Gulf Shores, Alabama with Category 2 conditions experienced elsewhere in this city. Category Four Hurricane (Sustained winds 131-155 mph, 114-135 kt, or 210-249 km/hr). Category Five Hurricane (Sustained winds greater than 155 mph, greater than 135 kt, or greater than 249 km/hr). People, livestock, and pets are at very high risk of injury or death from flying or falling debris, even if indoors in mobile homes or framed homes. Almost complete destruction of all mobile homes will occur, regardless of age or construction. A high percentage of frame homes will be destroyed, with total roof failure and wall collapse. Extensive damage to roof covers, windows, and doors will occur. Large amounts of windborne debris will be lofted into the air. Windborne debris damage will occur to nearly all unprotected windows and many protected windows. Significant damage to wood roof commercial buildings will occur due to loss of roof sheathing. Complete collapse of many older metal buildings can occur. Most unreinforced masonry walls will fail which can lead to the collapse of the buildings. A high percentage of industrial buildings and low-rise apartment buildings will be destroyed. Nearly all windows will be blown out of high-rise buildings resulting in falling glass, which will pose a threat for days to weeks after the storm. Nearly all commercial signage, fences, and canopies will be destroyed. Nearly all trees will be snapped or uprooted and power poles downed. Fallen trees and power poles will isolate residential areas. Power outages will last for weeks to possibly months. Long-term water shortages will increase human suffering. Most of the area will be uninhabitable for weeks or months. Hurricane Andrew (1992) is an example of a hurricane that brought Category 5 winds and impacts to coastal portions of Cutler Ridge, Florida with Category 4 conditions experienced elsewhere in south Miami-Dade County. When the the winds from these storms reach 39 mph (34 kts), the cyclones are given names. Years ago, an international committee developed names for Atlantic cyclones . In 1979 a six year rotating list of Atlantic storm names was adopted — alternating between male and female hurricane names. Storm names are used to facilitate geographic referencing, for warning services, for legal issues, and to reduce confusion when two or more tropical cyclones occur at the same time. Through a vote of the World Meteorological Organization Region IV Subcommittee, Atlantic cyclone names are retired usually when hurricanes result in substantial damage or death or for other special circumstances. The names assigned for the next several seasons are shown below. The National Hurricane Center (RSMC Miami, FL), is responsible for the Atlantic basin west of 30°W. If a disturbance intensifies into a tropical storm the Center will give the storm a name from one of the six lists below. A separate set is used each year beginning with the first name in the set. After the sets have all been used, they will be used again. The 2007 set, for example, will be used again to name storms in the year 2013. The letters Q, U, X, Y, and Z are not included because of the scarcity of names beginning with those letters. If over 21 named tropical cyclones occur in a year, the Greek alphabet will be used following the "W" name. In addition, after major land-falling storms having major economic impact, the names are retired. The National Hurricane Center (RSMC Miami, FL), is also responsible for the North East Pacific basin east of 140°W. If a disturbance intensifies into a tropical storm the Center will give the storm a name from one of the six lists below. A separate set is used each year beginning with the first name in the set. After the sets have all been used, they will be used again. The 2007 set, for example, will be used again to name storms in the year 2013. Central Pacific Hurricane Center (RSMC Honolulu) area of responsibility is from 140°W longitude to 180° longitude. The names below are used one after the other. When the bottom of one list is reached, the next name is the top of the next list. RSMC Tokyo - Typhoon Center is responsible for the western North Pacific (west of 180°) and the South China Sea.The practice of naming storms, which usually brings destruction, after persons appears to run counter to Oriental sensibilities. Thus, Asians like the Japanese and Chinese prefer to name their storms after other living things and also after inanimate objects like flowers, rivers etc. These names are used sequentially. If the last storm of the year is Cimaron, the first storm of the next year is Chebi. There is a single list of names that are used by all of the Bureau of Meteorology Tropical Cyclone Warning Centres (TCWC). This single list was introduced for the start of the 2008/09 season, replacing the three lists that existed previously. The Perth TCWC area of responsibility is the Southeast Indian Ocean. The Darwin TCWC area of responsibility is Arafura Sea and the Gulf of Carpenteria of north Australia. The Brisbane TCWC is responsible for the Coral Sea off northeast Australia. The Port Moresby TCWC is responsible for the Solomon Sea and Gulf of Papua. The name of a new cyclone is determined by sequentially cycling through list A. Standby list B is used to replace retired names in List A and any replacement name will be added to the bottom of list A to maintain the alphabetical order. The RSMC Nadi, in Fiji, are of responsibility is Southwest Pacific Ocean extending from 120° to 160°E and from the equator to 25°S.Lists A, B, C, and D are used sequentially one after the other. The first name in any given year is the one immediately following the last name from the previous year. List E is a list of replacement names if they become necessary. The RSMC La Réunion area of responsibility is Southwest Indian Ocean. Madagascar, Reunion, Seychelles, Comores, and Mauritius use a common list of names for identifying tropical depressions. Mauritius is responsible for naming depressions forming in the region lying between longitude 55°E and 90°E. Madagascar is responsible for the region west of longitude 55°E. Whenever a cyclone moves from the Australian region of responsibility to that of Mauritius, it is given a hyphenated name comprising the names from both regions for a period of about 24 hours. Thereafter it is known by the South West Indian Ocean name. RSMC New Delhi, India is responsible for the Bay of Bengal and the Arabian Sea. These lists will be used sequentially. The first name in any given year is the one immediately following the last name from the previous year.